Old Whelk House is a gorgeous traditional Norfolk flint and brick built property sitting in a raised position in Blakeney village giving it the most marvellous panoramic views of the Salt Marshes, Blakeney Harbour, Blakeney Point and out to sea! This superb property has a lovely enclosed garden laid to lawn and off road parking for two cars. Internally ‘Old Whelk’ is finished to a high standard throughout and unusually offers four bathrooms for three bedrooms! The ground floor consists of a large, stylish, kitchen which is opened up to the wonderfully coloured dining area. This has a large pine table and comfortable seating for six making it ideal for family meals and dinners with friends. The kitchen is very well equipped with a brushed stainless steel oven and halogen hob, integrated fridge and dishwasher, microwave, a small barista style coffee machine and everything else you would expect in a well equipped holiday home. Off this room at the front of the house is a large, sunny zip and link bedroom with its characterful original fire place, plenty of storage and small LCD TV. This bedroom can be made up as a twin or a kingsized double on request (please give at least 2 weeks notice). 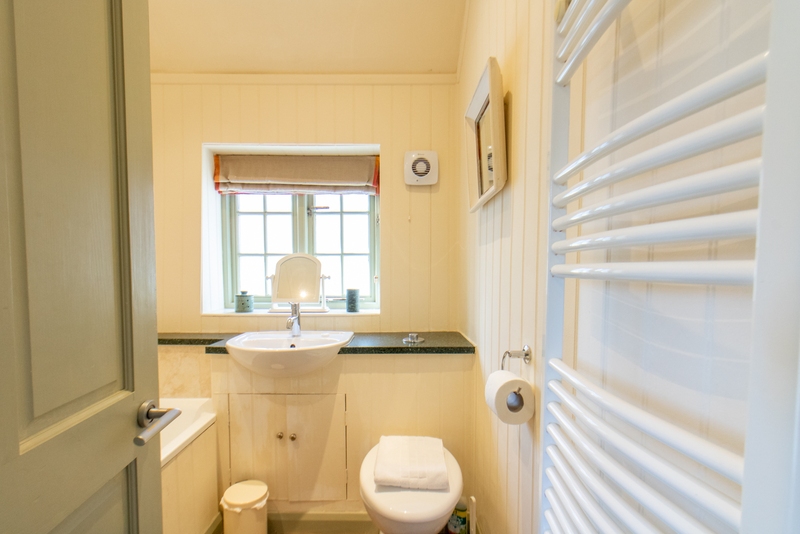 There is also a shower room on the ground floor, a useful utility room with a washer/dryer and freezer. Double doors lead out from a small hallway to the lovely, lawned back garden with BBQ, table and chairs for alfresco dining! Stairs lead up from the dining area in to the first floor sitting room. This room has lovely comfortable soft furnishings for six and is decorated in a lovely coastal theme, this is very fitting when standing at the Juliet balcony looking out at the most wonderful 180 degree views over the salt marshes and out to the sea. In the evenings there is large LED TV with freeview and DVD player, lots of board games, books and DVDs. Off the wide hallway is a stylish family shower room with drencher shower. At the front of the house above the zip and link room is a large, elegant Kingsize double bedroom again with its original fireplace and LCD TV. This bedroom has a newly fitted en-suite shower room with drencher shower. The wooden staircase again leads directly up in to to the second floor bedroom where there is another zip and link bed. This bedroom can be made up as a twin or a kingsized double on request (please give at least 2 weeks notice). This 2nd floor bedroom has yet more stunning panoramic views over Blakeney Harbour, the Salt Marshes and out to sea and has a cleverly tucked away en-suite bathroom with clawfoot bath. As with all of the bedrooms is Old Whelk House this bedroom has a small TV. All in all Old Whelk House is a superb example of a large three bedroom holiday home in Blakeney. 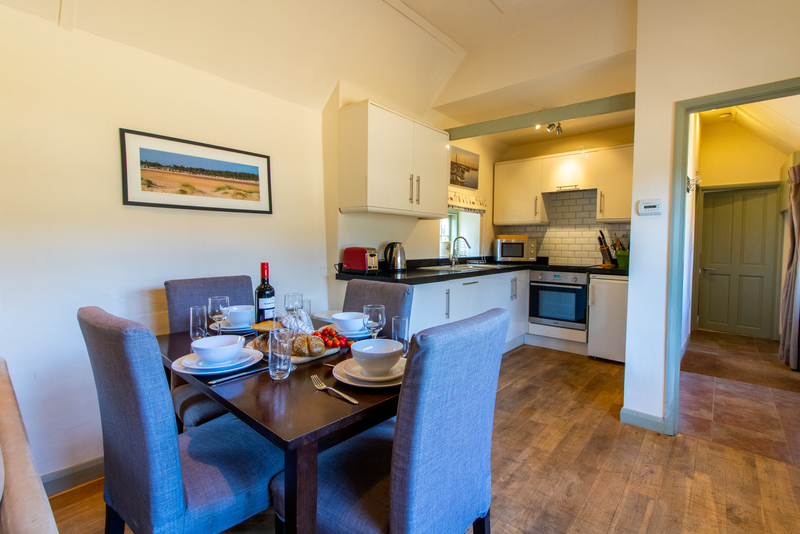 With breathtaking coastal views and a good sized garden it offers everything a family or group of friends could possibly need when on holiday in North Norfolk.